Down south, congealed fruit salads are a big thing. Every church social, potluck or holiday meal includes a version of this tasty treat. Each family has their own recipe and each recipe has its own name, but they are all similar and usually contain the following or variations: pudding, Jello, fruit, nuts, KoolWhip, etc. Some have cream cheese, some don’t. In my family, my sister-in-law makes a version she calls “FLUFF”. The recipe I use came from the “Ask Heloise” section of the newspaper. It’s tasty, sinful and especially refreshing on a hot summer’s afternoon. Considering the high in Birmingham was 106F today, I needed something refreshing, so I whipped up a bowl of this wonderful salad, and thought I’d share this “tried and true” recipe with you. If using a fresh pineapple, here’s a secret test to see how ripe your fruit is. Try pulling out one of the green leaves atop the pineapple. A pineapple at the perfect stage of ripeness will give up a leaf with little pressure. It should also be a yellow color on the outside and not green between the scales. In a medium bowl, add the crushed pineapple and chunks with their juice. Sprinkle the pistachio pudding over the pineapple, stir and let it sit for a minute or two. Next add the nuts, coconut and marshmallows and combine. Fold in the softened KoolWhip. 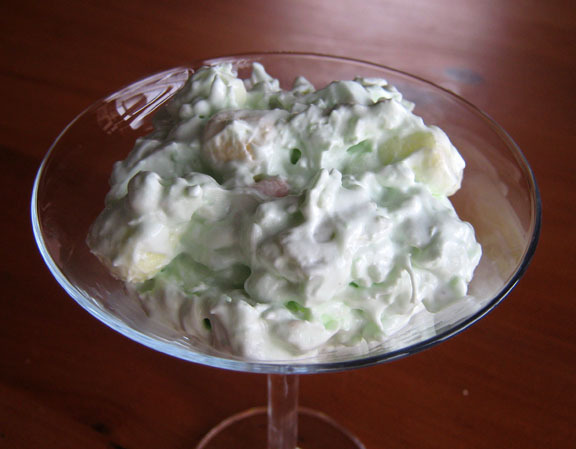 This entry was posted in Dessert, Holiday Sides, Salad and tagged coconut, fluff, jello, koolwhip, marshmallows, nuts, pecans, pineapple, pistachio, pudding, walnuts, whipped topping by quarlj01. Bookmark the permalink.